Halloween is at the end of the week and you are probably busy preparing costumes and candy for your little pumpkins. This time of year is full of sweet treats from the candy to caramel apples and everything in between. Halloween doesn’t have to be scary for your health, there are ways to have fun and stay healthy too! Here are a few tips. 1. Have a plan for the candy collected during trick-or-treat. Do you have household rules for how many candy pieces your kids can have? It is a smart idea to review with your kids beforehand how many candy pieces they can have per day and how many they can eat when returning Halloween night. You can also offer a prize for “trading in” candy. Find something that works for your family. 2. Eat a healthy dinner before leaving for the night. Having a balanced, filling meal before heading out to a party or trick-or-treating is important. If you are full it can help cut down on the amount of candy consumed. Check out some kid-friendly Halloween dinner ideas here. 3. Provide alternatives to candy. Having non-food options like toys, stickers, or temporary tattoos is a great idea for trick-or-treat. When having Halloween parties or dinners serve veggies, fruit and healthier options (trail mix etc.) in addition to the baked goods and candy. 4. Purchase candy the day before. Avoid temptation by purchasing your trick-or-treat candy last minute. If you don’t have it in the house you (and your family) won’t be enticed to eat it. 5. Trick-or-treat with your kids. 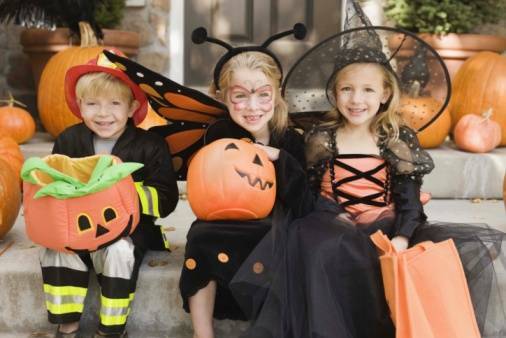 Head out with your kids to trick-or-treat in your neighborhood. Not only is it important to stay with them for safety, but walking is great exercise. Make sure everyone is wearing comfortable shoes and is properly dressed for the weather (rain, cold, etc.). 6. Enjoy the holiday. Don’t get too caught up on the junk food. It is one day of indulging, don’t fill guilty if you eat a few candy bars. As long as you eat healthy most of the time, you should be able to enjoy the treats! We wish you all a safe and fun Halloween night!